I've been working this cold weekend on finally tackling items. Seventh Umbral had made some leeway on the items, but didn't get very far with figuring out the item blocks themselves. On Saturday I figured out the general layout of how the initial inventory update works. It is made up of a start packet, multiple item packets, and an end packet. The opcodes are 0x146 and 0x147, with both 0x14A and 0x14B used for the items themselves (though the data is the same). 0x149 seems to be a "end of list" packet, showing up if there is only 1 item packet or as the last item packet. The start/end tags define where exactly the items get show: Key Items, Currancy/Crystals, or Normal Inventory. There are also more tags, and these most likely are for the Bazaar, Meld Requests, and Loot tabs. Today I found a lot of the item block itself. Below is an example of one of those blocks. This is a Vanya Hat +1. I do realized I accidentally left it as 6 Vanya Hat's but it seems the game fixes that anyway. Rieze23 November, 2015What a valiant effort you are doing here. I am a 1.0 player and i missed it a lot. 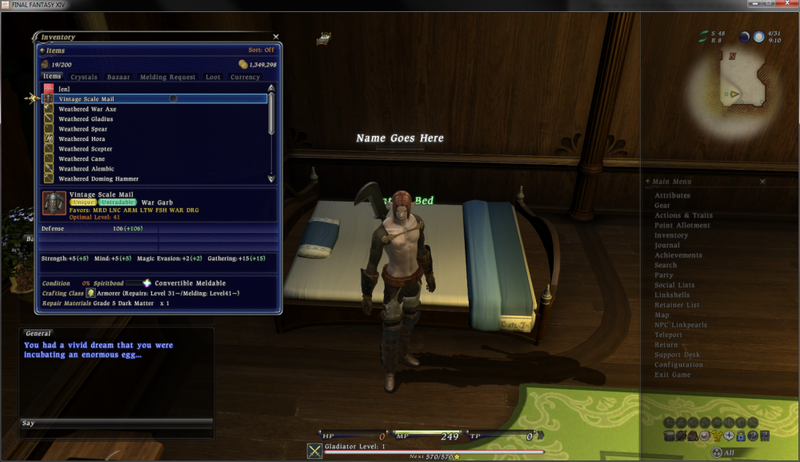 I log in to seventhumbral private server from time to time but the cutscenes are lacking. if only I can view them all. 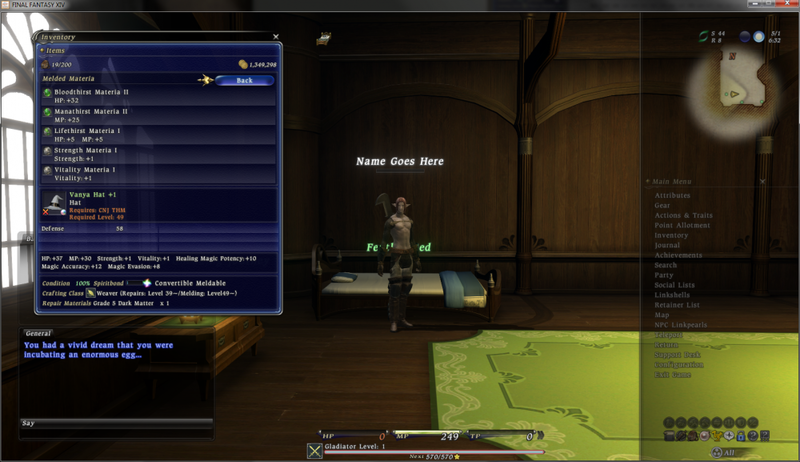 I noticed that you figured out the model IDs in FFXIV, is there a way we can get the IDs as well? Thanks and good luck with your project. Ioncannon23 November, 2015You'd like to know that I figured out the "completed quests" packet and have access to ALL cutscenes! It seems however that any cutscene with the path companion won't load due to non being specified.